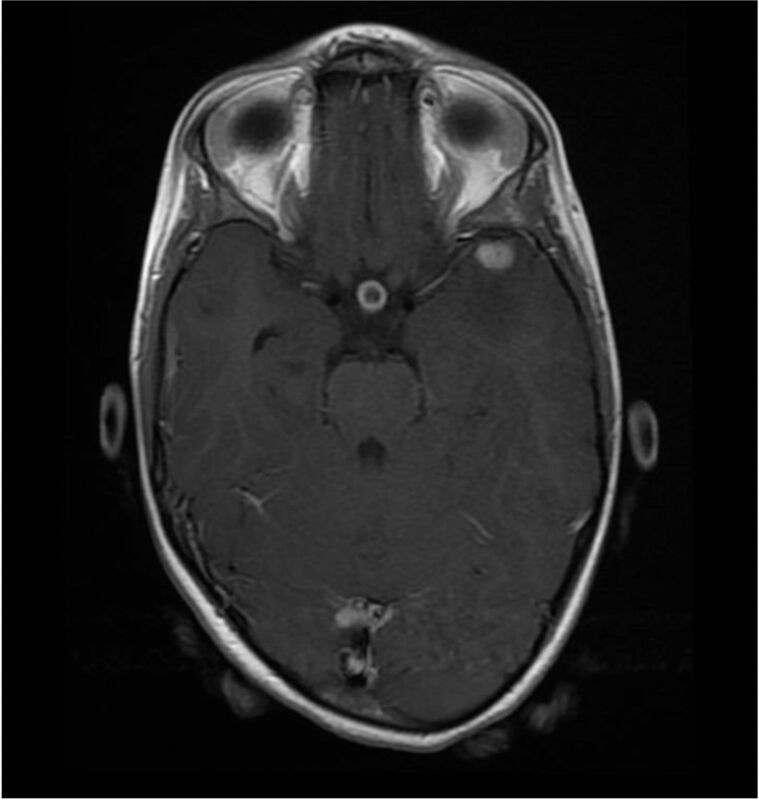 A 6-year-old girl presented acutely with worsening frontal headaches. She had a 3-month history of lethargy, reduced appetite, weight loss, cough and intermittent fevers. A chest X-ray showed a left upper lobe consolidation, and a CT head showed multiple enhancing lesions with significant surrounding oedema in both cerebral hemispheres. Due to the strong suspicion of tuberculosis (TB), she was admitted and treated with anti-TB therapy and steroids. Following this, pulmonary infection with Mycobacterium tuberculosis was confirmed by a positive PCR from induced sputum. Cerebral spinal fluid (CSF) analysis was normal and tested negative for M. tuberculosis on PCR. During her first week of treatment, she developed polyuria, nocturia and polydipsia and was diagnosed with central diabetes insipidus. She was started on desmopressin which rapidly improved her symptoms, and she was continued on desmopressin for 3 months. Currently, she remains well and has shown a good response to TB treatment. TB is a significant global disease with the WHO estimating the total number of annual cases and deaths in children (aged 0–14) at 1 040 000 and 253 000, respectively, in 2016.6 In 2016, the incidence of TB in England was 10.2 per 100 000 with 5664 cases reported in total. Of all these cases, 204 occurred in children (aged 0–14). In England, the incidence of TB is over three times higher in non-UK-born children compared with UK-born children with rates of 6.8 per 100 000 and 1.8 per 100 000, respectively. The top three countries for TB incidence in non-UK-born children are India, Pakistan and Somalia. As expected, the incidence of TB varies based on geographical area; with the highest incidence in major cities such as London and Leicester. Moreover, within London, there is also significant variation; with areas such as Newham having an annual incidence of 69 per 100 000 and the City of London having an annual incidence of 3.8 per 100 000.1 The country of birth and where the patient currently lives should form part of the routine paediatric history but it is especially important when TB is suspected. A 6-year-old girl presented acutely to her local hospital with a 2-day history of vomiting. She had a 1-week history of worsening frontal headaches that woke her up from sleep and reported to be worse in the morning. In addition, she had a 3-month history of lethargy, reduced appetite, weight loss, cough and intermittent fevers. She was born in the Yemen and moved to Somalia, Kenya and then to the UK. There were no known TB contacts, her family was well and past medical history was unremarkable. She was vaccinated and had received BCG immunisation at birth, leaving a scar. On initial examination, she was afebrile and clinically stable with normal neurology. She was admitted and commenced on broad-spectrum antibiotics, anti-TB therapy and steroids. On day 4 of admission, it was noticed that she had polyuria, polydipsia and nocturia and was subsequently diagnosed and treated for central DI. Her admission blood test results showed a haemoglobin of 11.3 g/dL, mean corpuscular volume of 68.4 fL, white cell count (WCC) of 14.4×109/L (neutrophilia 12.0×109/L), C reactive protein of 140 mg/L, erythrocyte sedimentation rate of 114 mm/hour and albumin of 33 g/L. A blood film confirmed a microcytic anaemia and neutrophilia. HIV and hepatitis C serology were negative, and her CSF had 4 WCC, no organisms, and normal glucose and protein. Subsequent Polymerase Chain Reaction (PCR) on her CSF was negative for Mycobacterium tuberculosis. A CT brain on admission showed multiple ring-enhancing lesions with significant surrounding cerebral oedema noted in both hemispheres which were highly suggestive of an infective process. An admission MRI brain (figures 1–3) and spine supported that these cerebral lesions were in keeping with tuberculomas. It was also noted that a suprasellar lesion was associated with the infundibulum of the pituitary gland, and there was no spinal involvement. Pituitary tuberculoma, MRI, axial view, T1 with gadolinium. Diffuse tuberculomas throughout the cerebral hemispheres, MRI, axial view, T1 with gadolinium. Pituitary tuberculoma, MRI, coronal view, T1 with gadolinium. A CT chest showed further radiological evidence of TB with necrotic lymph nodes and miliary shadowing in the lungs. Ultrasound abdomen was normal. A PCR on induced sputum was positive for M. tuberculosis on day 4 of admission. PCR on gastric lavage had been negative at the referring hospital. A water deprivation test was not performed during her acute admission. A follow-up urine and serum osmolality was performed at 4 months from the start of anti-TB treatment when our patient had been off desmopressin for 2 weeks. The results were obtained after overnight fluid deprivation and were normal. Initially, it was considered that her polyuria might have been related to an osmotic diuresis caused by hyperglycaemia secondary to corticosteroids. However, blood sugar monitoring was within normal limits, and there was no glycosuria. Hence, this was eliminated from the differential. There was no evidence of a urinary tract infection. A diagnosis of central DI caused by a compressive tuberculoma in the suprasellar region was considered. Central DI is characterised by impairment of antidiuretic hormone (ADH) secretion, and it can be partial with some residual ADH secretion or complete with no ADH secretion. 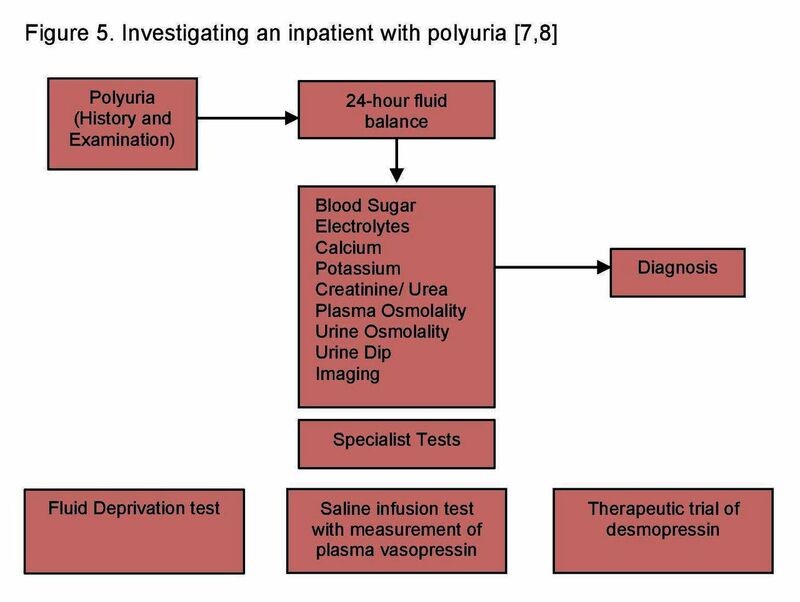 Abrupt onset of the polydipsia, polyuria and nocturia. Primary or secondary tumours8—no radiological evidence to support this in our patient’s imaging. Drugs for example, lithium—our patient was not on any drugs known to cause DI. Renal failure/postobstructive uropathy7—normal renal function and normal abdominal ultrasound. Further evidence against a nephrogenic DI was the successful response to treatment on starting desmopressin. On admission to her local hospital, our patient was started on intravenous fluids, ceftriaxone and metronidazole. She was started on these broad-spectrum antibiotics to cover for sepsis and abscess forming bacteria such as Staphylococcus aureus, Streptococcus spp and anaerobes in keeping with local antimicrobial guidelines.10 Based on her clinical history, initial bloods and CT brain, it was felt that her symptoms were caused by TB, and she was subsequently started on quadruple anti-TB drugs (isoniazid, rifampicin, pyrazinamide, moxifloxacin), corticosteroids, pyridoxine and lansoprazole for gastroprotection. She was transferred to a tertiary hospital for ongoing care. Ceftriaxone and metronidazole were discontinued when the diagnosis of TB was confirmed by PCR on day 4 of admission. Her DI was treated with desmopressin 50 µg twice daily on day 12 of admission and effectively treated her polyuria, polydipsia and nocturia. She remained an inpatient for 14 days and was well throughout. On starting desmopressin, blood electrolytes were measured 12 hourly for the first 24 hours then on alternate days for 4 days and then weekly until desmopressin was discontinued. The main reason for electrolyte monitoring was to observe for a dilutional hyponatraemia which can occur when treating with desmopressin.7 Her electrolytes remained normal throughout. She continued on desmopressin for 10 weeks which was continued at the same dose for 6 weeks and then weaned over a 4-week period. She was advised to drink as normal. Her steroids were weaned and discontinued at 10 weeks. Prior to discontinuing desmopressin and steroids, an MRI was performed. An important aspect of our inpatient care was the involvement of the play therapists and school teachers. Our patient was treated in an isolation cubicle throughout her 14-day admission. Our patient is currently 9 months into her TB treatment and remains well and fully independent. Radiologically, there has been a good response to TB treatment confirmed by an interval MRI brain at 2 months; of note, the enhancement of the suprasellar lesion was less marked. Thyroid function tests were initially normal in our patient but a subclinical hyperthyroidism occurred at 2 weeks (see table 2). This was not treated and returned to normal 2 weeks later. She completed 3 months of desmopressin and has now been off desmopressin for 6 months. TB affecting the CNS is uncommon.1 It may present with symptoms of meningism, nausea, headache, photophobia, vomiting, sleep disturbance, seizures, reduced consciousness and focal neurological deficit.11 Tuberculomas within the CNS may exert compressive effects that may produce unusual neurological symptoms. 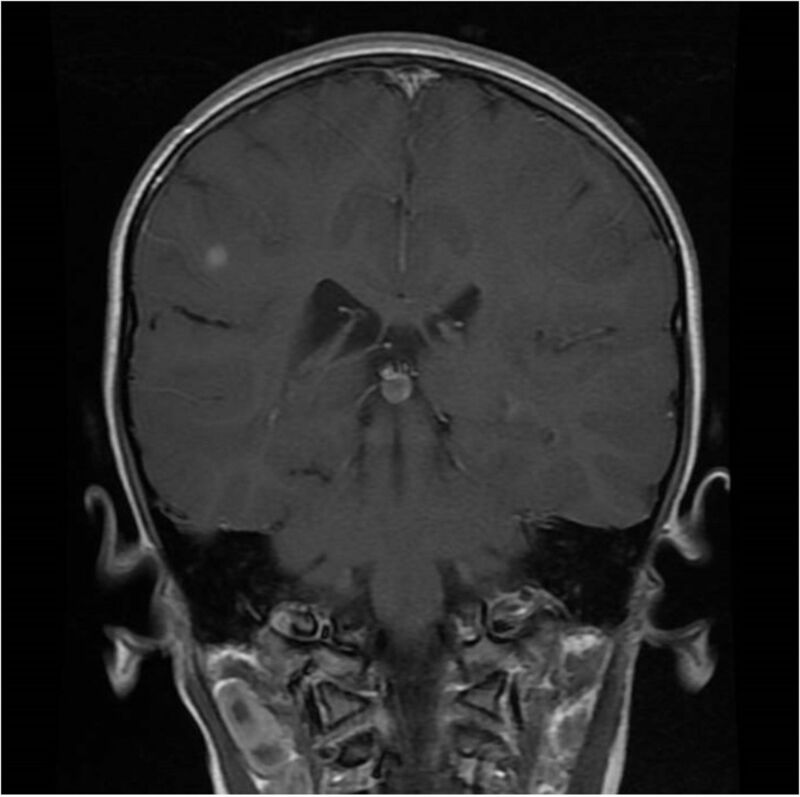 DI is a recognised rare complication of cerebral tuberculomas and TB meningitis.2 3 7 12 Our patient presented with cerebral and pulmonary TB with symptoms of DI manifesting after the commencement of anti-TB treatment. 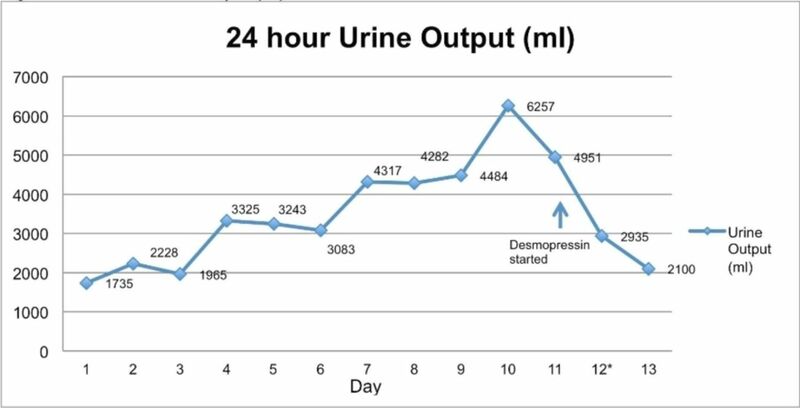 In figure 4, it can be seen that our patient’s urine output peaked at day 10 and then started to improve on day 11 prior to starting desmopressin. This improvement may be explained by an initial resolution of the pituitary tuberculoma but it is hard to say whether the DI would have resolved on solely treating the pituitary tuberculoma—a balance must be taken between watching and waiting versus treating. 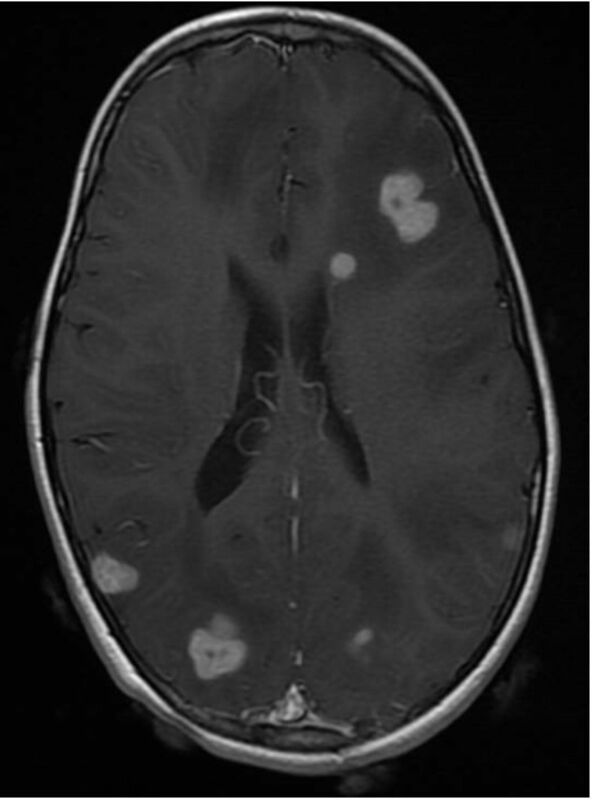 In a patient with radiological evidence of a tuberculoma sited near the suprasellar region, it is important to be vigilant for clinical signs of suppression or overactivation of the hypothalamic pituitary axis.4 A baseline and interval set of pituitary hormones may help identify a subclinical condition and allow early reimaging and intervention if necessary. Table 2 illustrates that our patient initially had normal TSH, T3, T4, cortisol, luteinising hormone (LH), FSH, insulin-like growth factor (IGF) 1, growth hormone (GH); however, it was noted that she became subclinically hyperthyroid at 2 weeks. This was not treated and resolved at 1 month. A recommended set of pituitary hormones that should be performed include: TSH, T3, T4, cortisol, LH, FSH, GH, IGF and prolactin. These hormones should be repeated several weeks into anti-TB treatment. Acquired causes of central DI are more common than inherited causes with idiopathic central DI forming the largest group accounting for 29% of cases.16 Other causes of central DI include malignancy (eg, craniopharyngioma, infection and trauma).7 Figure 5 outlines a general approach to investigating polyuria and polydipsia in a paediatric inpatient. We are very glad that we can write our perspective in this journal because we wanted to tell everyone about the excellent care we received. Luton and Dunstable Hospital & St Mary’s Hospital your staff are amazing and they were so attentive to all of our needs. We are extremely impressed with the level of care that our daughter received and the kindness and compassion of your staff. Thank you. We would like to thank Dr Michael Eisenhut who first diagnosed the disease and every other doctor and nurse that took care of us during our stay. Each and everyone was kind and compassionate. I cannot say enough about our doctors, the nurses and surgical staff—just EVERYONE was so good to us and we received EXCELLENT care, before, during and after. Young children are at high risk of progression of tuberculosis disease, including central nervous system (CNS) disease. Nocturnal headaches in a patient with tuberculosis should trigger investigation of the CNS for tuberculomas. Radiological screening of the CNS is mandatory in all patients with miliary tuberculosis. Patients with CNS tuberculomas in the region of the pituitary require regular neurological assessment and should have prompt additional investigation of the hypothalamic pituitary axis. Tuberculomas sited near the pituitary can cause both suppression and overactivation of the hypothalamic pituitary axis. The initial approach to investigating a patient with diabetes insipidus requires an accurate 24-hour fluid balance. Thank you to Dr. M Coren and Dr. N Bridges, Consultant Paediatric Endocrinology, for their advice regarding investigation and management of this child. Public Health England. Tuberculosis in England: 2017. London: Public Health England, 2017.
. Suprasellar tuberculoma presenting with diabetes insipidus and hypothyroidism–a case report. Neurol India 2001;49:314–6. World Health Organization. Global tuberculosis report 2017. Geneva: World Health Organization, 2017.
. Cheetham T Diabetes Insipidus. Archives of Disease in Childhood 1998;79:84–9.
. Clinical chemistry. Edinburgh: Mosby, 2008. Imperial College Healthcare NHS Trust (2017). Anti-infective Guideline – First Line Drug choice for Children presenting with Specific Infectious Syndromes v6.0. Contributors The corresponding author, SC, was responsible for drafting this article. EW, LG and ME were responsible for critical revisions of the article. ME, EW, LG and SC were all involved in the care of this patient. ME obtained consent. EW supervised the overall process.